Let’s now assume that all parties who wish to bid are assembled at the Courthouse for the foreclosure auction. The Referee will first read (out loud) the Judgment of Foreclosure. Then, based on the actual amount owed to the lender as reflected in the Judgment, he will request an opening bid. For example, the Judgment may be in the amount of $300,000.00. This sum would include the amount due on the defaulted loan, all accrued interest and late fees from the loan, the costs and attorneys fees incurred by the lender in bringing the foreclosure proceeding, plus the fees due to the Referee. Therefore, the bidding would start at $300,000.00. 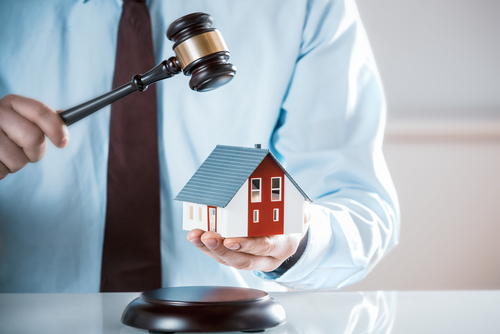 If no party (excluding the lender) feels that the property is worth this amount, and no one bids, then the lender’s representative will bid this amount and the lender will become owner of the property. However, let’s assume in this instance, that the property is actually worth $400,000.00. Third parties will now bid above the lender’s “upset price” of $300,000.00 (usually bidding is in increments of $1,000.00), and the winning bid in this case may be $350,000.00. The winning bidder usually is required to immediately give the Referee a deposit of 10% of the successful bid. In our hypothetical, this would be $35,000.00. Personal checks are not accepted, so bidders must have a bank or certified check payable to the Referee available at the auction to cover this deposit. Obviously, a bidder does not always know in advance what the winning bid will be. Our firm recommends that bidders bring a series of bank or certified checks, one for 10% of the judgment amount, and several more, each for $1,000.00 or $5,000.00, so that the deposit can be paid to the Referee “on the spot.” The Referee will then give the successful bidder a receipt for their deposit, and, under most circumstances, the bidder will then have thirty days to close the transaction and obtain the deed to the property by paying the remaining amount of the bid to the Referee.